Target has been celebrating Earth Day for 42 years. Each year, April 22 marks the anniversary of the movement sparked by U.S. Senator Gaylord Nelson in the spring of 1970. After years of witnessing environmental damage like the Santa Barbara, Calif. oil spill in 1969 and troubled by the lack of awareness, Senator Nelson rallied for the first-ever national “teach-in” on the environment—what we now know as Earth Day. Since the first Target store opened in 1962 and the first Earth Day in 1970, Target has empowered guests to lead more sustainable lifestyles by providing the right information, tools and incentives. Even the smallest step towards sustainability—like handing out tiny pine trees on Earth Day—can make a big difference. So whether it’s company-wide recycling initiatives, using sustainable practices on commercial sets, or offering sustainable product choices that impact the everyday lives of its guests, environmental sustainability has always been a part of Target’s commitment to building strong, healthy communities. 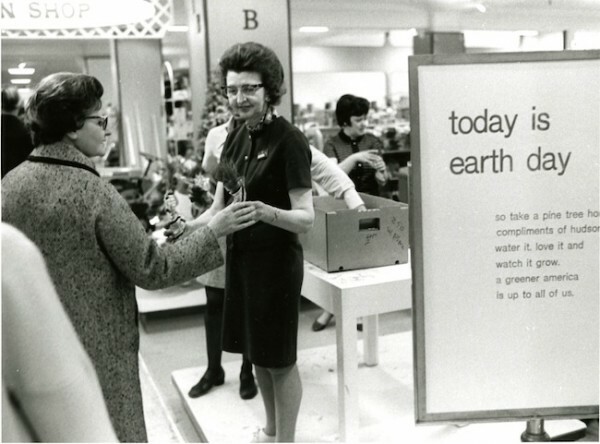 Below, we highlight a few of Target’s big Earth Day moments over the years. 1960’s: The first Target store opens in Roseville, Minn. Part of Target’s giving is directed towards urban renewal projects, including cleaning up rivers and waterways and revitalizing Nicollet Mall in Minneapolis. 1970’s: Along with 20 million Americans, Dayton Hudson Corporation (now Target) celebrates by handing out free trees to guests. Volunteers also help plant trees and clean grounds in surrounding communities. 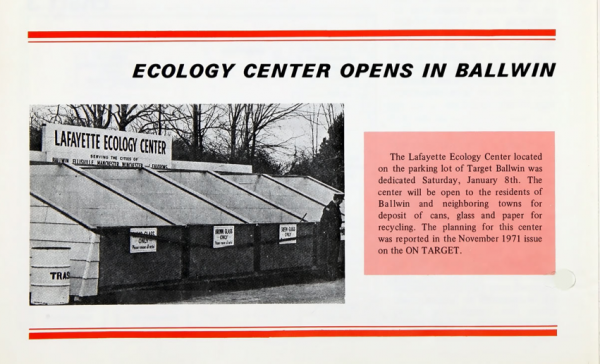 1972: First “ecology center” (what we now know as recycling centers) opens in the parking lot of a Target store in Ballwin, Mo. Residents of neighboring towns could recycle cans, glass and paper at the Lafayette Ecology Center. 1970’s: Target makes a commitment to reduce store energy consumption by turning down lights, adjusting building temperatures and making trucks and trailers more efficient. 1989: Target adopts a centralized companywide energy management system for stores, distribution centers and headquarters. 1990: For the twentieth anniversary of Earth Day, Target helps kids get excited and involved in conserving energy, reducing pollution, recycling and saving wildlife through support of the non-profit organization, Kids for Saving Earth (KSE). Founded in 1989 by the family of Clinton Hill (an 11-year-old boy who died of cancer and dedicated his life to saving the Earth), nearly half a million children and adults dedicate themselves to protecting the Earth through the “KSE” promise. 1991: Target sends a delegation of company team members, Clinton Hill’s family and a few school classmates to the U.N. Youth Forum for the Environment, Earth Expo ‘91. One thousand local Minneapolis students sing a chorus of “The Kids for Saving Earth Promise,” which was shown live via satellite at the forum. 1992: One day wasn’t enough for all the Target celebration. 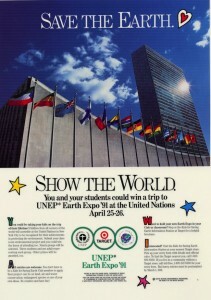 So, in 1992, Target celebrates “Earth Week” for the first time. In Los Angeles, Target team members walk alongside Olivia Newton-John, Leonard Nimoy, Ed Asner and Bobby Kennedy Jr. in a star-studded Earth Walk. Target also introduces “opportunity carts” at stores, which are filled with products ranging from “rainforest cookies” to merchandise made with recycled products. Later that year, a new environmental program for schools, called Target Earth, is unveiled. 1993: Remember hit ‘90s sitcoms Blossom and Brotherly Love? Well, teen heartthrob Joey Lawrence becomes the official face of Target Earth and helps celebrate Earth Day, much to the delight of young girls everywhere. Joey helps spread the word about Target’s new “Earthmobile,” a portable library stacked high with environmentally friendly books for kids. In honor of Earth Day, Target holds a sweepstakes where 500 lucky kids across the country can win an Earthmobile for their school or Target Earth t-shirts for their classrooms. In addition, Target stores in L.A. team up with Permanent Charities Committee of the Entertainment Industry to sponsor a fundraising walk-a-thon. More than 10,000 walkers gather pledgees to raise money for social, arts and environmental charities, including KSE. 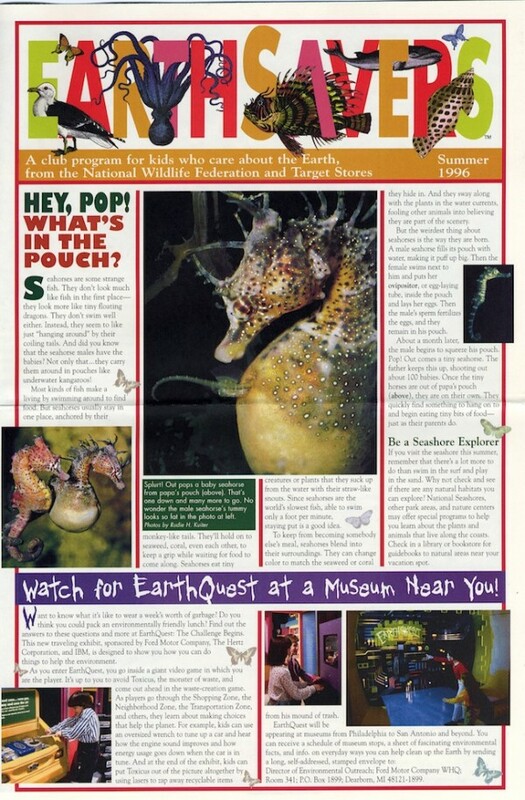 1995: The new EarthSavers program is unveiled in 1995, with the National Wildlife Federation, a club designed to inspire children to care for the Earth and replacing the KSE program. 1995: Target’s first “eco store” in Fullerton, Calif. opens on Earth Day. It includes energy saving skylights, recycled water for the Garden Center and compost from Food Avenue left overs, resulting in reduced energy consumption by 30 percent. 1996: Through joint efforts in Pasadena, Calif., 5,000 local kids participate in in-store workshops. Kids learn how to build Butterfly Bungalows (habitats). After raising butterflies, they are released at the KidsSpace Museum in Pasadena. 1998: Target stores nationwide revitalize sustainable practices in honor of Earth Day and spread the message to team members and local communities through volunteer activities. 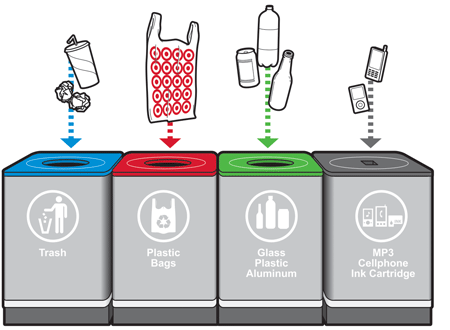 The cafeteria at Target headquarters in Minneapolis offers even more recycling bins to better educate team members on best practices. 2003: Target installs its first rooftop solar system. Today, Target has solar panels on the roofs of more than 20 stores across the country. 2006: Target is certified as a USDA Organic grocer. 2009: Target begins offering a 5-cent discount for each reusable bag used during checkout. Since the program’s launch, Target has returned millions of dollars to guests and diverted hundreds of millions of plastic bags from landfills. 2010: Target launches recycling stations in all stores in celebration of Earth Day. The recycling stations allow guests to recycle plastic bags; glass, plastic and aluminum containers and small electronics. The same year, Earth day becomes Earth Month. That’s right—30 full days of love and attention dedicated to our humble home. At the end of the year, Target announces its sustainability commitments: key milestones which the company aims to achieve by 2015. 2012: Come celebrate Earth Day at your local Target store on April 22. 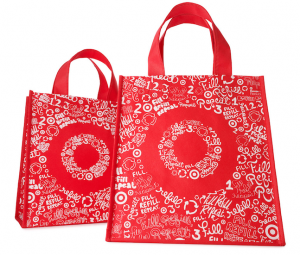 Target will give away 1.5 million reusable bags at stores nationwide!